When you take the Science section of the GED test, you have to answer a variety of the same types of questions in the other tests, all in 90 minutes. 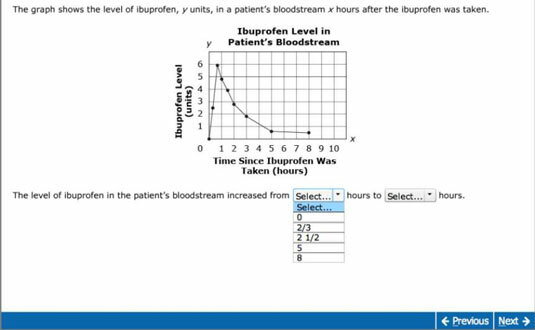 These sections focus on the slight differences you may see on the computer screen in the different types of questions. Take a look at this example of a multiple-choice Science question. Notice that the passage is longer than one page on the computer screen. Tabs on the side can move the text up and down. Moving it down reveals other possible answers. Always be aware of the screen size limitation and advance pages or scroll up or down to ensure that you have all the information you need to make a decision. For fill-in-the-blank questions, you see a statement or question followed by a box. You’re expected to type the appropriate word(s) or number(s) into that box. In the example, the percent sign after each box indicates that you need to enter a number. Questions involving a drop-down menu are similar to drop-down menu items in the other sections of the GED test. They’re just a variation of the multiple-choice questions. You use the mouse to expand the choices and then again to select the correct one. 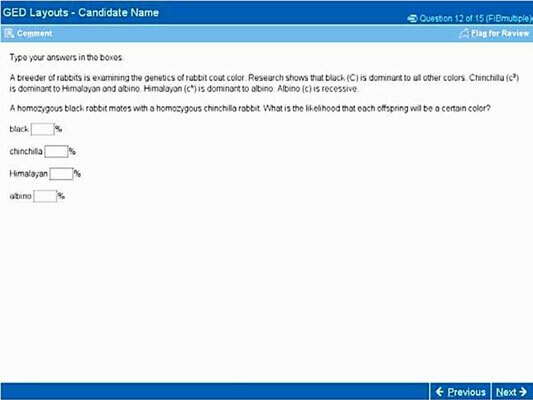 The general format of these types of questions is similar throughout all the sections of the GED test. 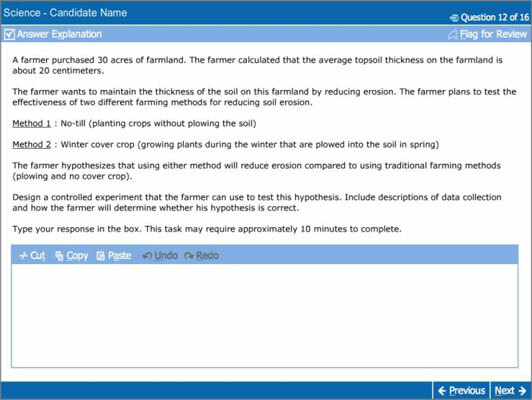 On the computer, you’ll see spaces and a list of possible answers to use in filling the spaces. Using the mouse, you can drag the word, numbers, or phrases to their appropriate location to create an answer. 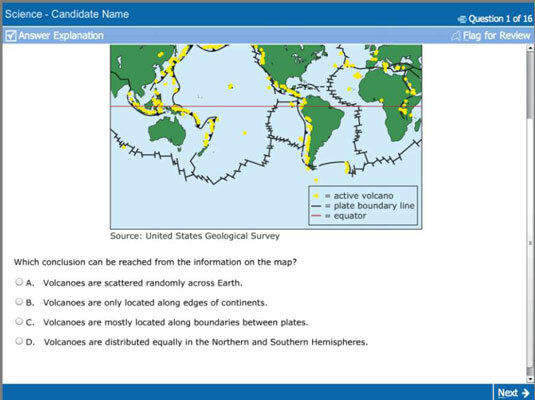 On the computer screen, hot spots are areas that, when clicked with a mouse, are recognized as correct answers. You can’t tell where the areas are by looking at the screen; you have to figure it out and click on the spot that indicates the answer. 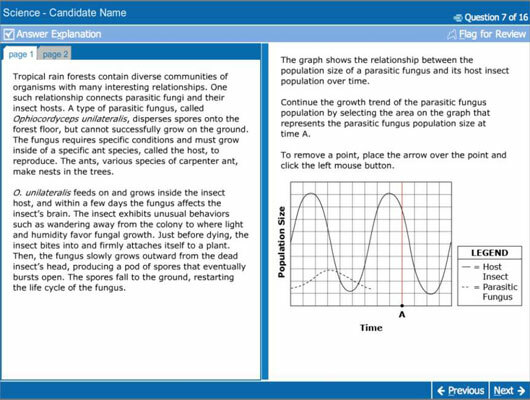 Hot-spot formats appear in the Science and Mathematical Reasoning sections of the GED test. By clicking the mouse, you can draw a graph on the computer screen. This item requires more than just clicking on an answer choice. Like the Reasoning Through Language Arts and Social Studies Extended Response items, it’s a written answer. The only difference is that in the Science section you have to write only a paragraph or two. You use the keyboard to type in the required information in the boxes.